Philadelphia District Attorney Larry Krasner announced new internal policies on Thursday, 3/21, that are meant to drastically reduce the number of people under parole or probation. Krasner wants to end what he calls 'mass supervision.' Philadelphia has 42,000 people under some form of probation or parole as of 2017. That's 1 in 22 adults. New York City has 12,700. "When people are supervised for too long, they tend to fail," Krasner said. "They lose their jobs, they commit new crimes and we don't need new crimes." 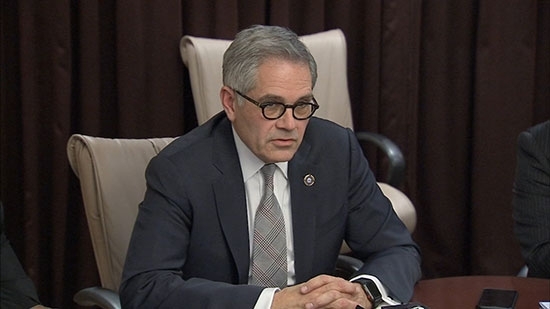 Krasner is proposing that those sentenced for misdemeanors should get no more than 9 months probation/parole and those sentenced for felonies should get no more than 3 years. He says these are only recommendations and exceptions can be made. Read the entire memo below. Pennsylvania Governor Tom Wolf toured Taggart Elementary School in South Philadelphia on Thursday, 3/21, to drum up support for a plan to tax natural gas production to help pay for environmental remediation projects in the state's schools. The multibillion-dollar capital plan would be funded by taxing Marcellus Shale natural gas production. It would help schools clean up health hazards in aging buildings, such as lead paint. Wolf is proposing a $4.5 billion bond that would be used for many things from controlling floodwaters to fighting blight. Any such measure would have to pass through the Legistature. Safehouse, a nonprofit founded to open a safe injection site in Philadelphia, says they are close to signing a lease on a location in Kensington. Ronda Goldfein, vice president of Safehouse's board, says they have looked at over two dozen locations through out the city, but have settled on this one on Hilton Street near the Allegheny Avenue station of the Market-Frankford Line. It is reported that they will have to pay little to no rent. The site is in the heart of Philadelphia's opioid crisis where over 1,000 people have been dying each year. It is also in a commercial stretch and wouldn't disturb residents. The safe site concept is, loosely, to have a place where an addict can come and use their drugs with trained medical staff watching in case of emergency or overdose. If the user was out in the street, no one would be there to help. The site can also provide outreach to try to get the person to stop using drugs and seek treatment. The legality of the arrangement is still up in the air. This would be to first such safe injection site in the United States. The U.S. Attorney’s Office in Philadelphia recently filed a lawsuit asking a judge to rule on the legality.